Photos by Deborah Scott , Anne Peters, and Kurt Lemke. ©D. Scott and Anne Peteres 2002; ©2013 Kurt Lemke; all rights reserved. Top, Left to Right: Riva Ridge, Nijinsky II, Mr. Prospector, Secretariat. Second row: Gallant Fox, Blenheim II. Fourth row: Bold Ruler, Reviewer. Fifth row: Buckpasser, Hoist The Flag. Sixth row: Swale, Riva Ridge. Seventh row: Nijinsky II, Mr. Prospector. CLAIBORNE FARM has been owned by the Hancock family for three generations and gets its name from the Clay family, which owned the land. (Arthur Hancock Sr. married into the Clay family.) The original Clay estate was known as "MARCHMONT," which is now a division of Claiborne, where there is a second cemetery for stallions and broodmares. 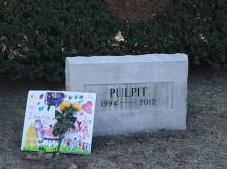 A book could be written about the horses buried in the Claiborne main stallion division cemetery, which is located behind the office at the entrance to the great farm. Those buried here include leading American sires *SIR GALLAHAD III, *BLENHEIM, *NASRULLAH, *PRINCEQUILLO, and *AMBIORIX, all imported stallions which introduced their bloodlines to this country with great success. 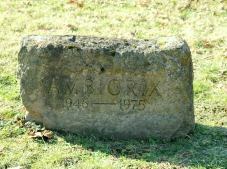 The Claiborne cemetery's more recent interments include SECRETARIAT, NIJINSKY II, and MR. PROSPECTOR. -- A.P.